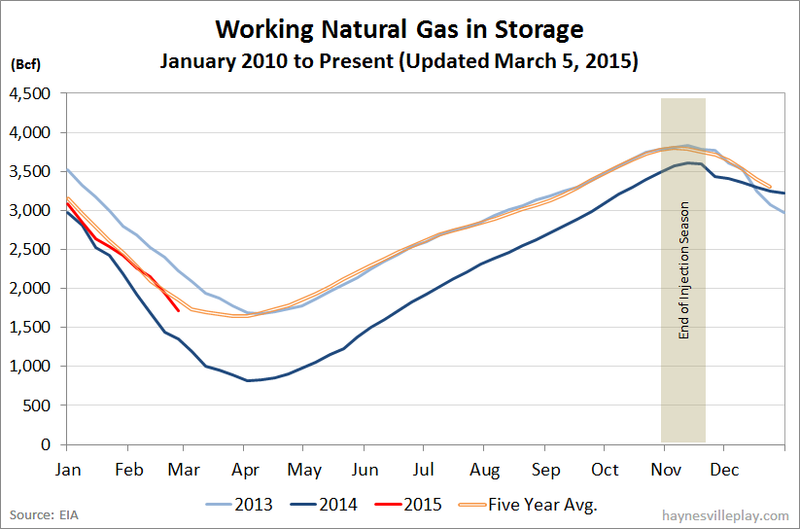 The EIA announced this morning that working gas in storage was down 228 Bcf to 1.71 Tcf. The weekly withdrawal was 58% larger than last year (-144 Bcf) and 98% greater than the five year average (-115 Bcf). The current storage level is now 40.4% above last year (1.218 Tcf, a difference of 492 Bcf) and 7.7% below the five year average (1.853 Tcf, a difference of 143 Bcf). It was a chilly week last week in the Lower 48 with an average temperature of 28.3 degrees, which was 11.3 degrees colder than the same week last year and 10.9 degrees colder than average.